This project was undertaken at Strathewen Primary School and offered children the opportunity to express their observations of the landscape that surrounded their school and home. 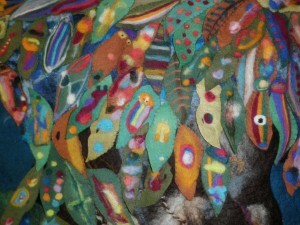 Creative self expression was encouraged using felting techniques. Their tree stands strong and tall reflecting their resilience. 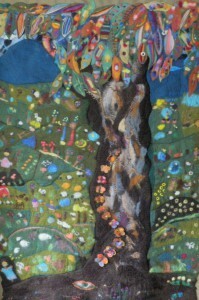 The tree was created using wet felting techniques. The tree is situated in a landscape full of life and regeneration since the firestorm of Black Saturday which had a devastating impact on Strathewen.The children needle felted details onto prefelt and cut out leaf shaped felt, making colourful individual leaves. 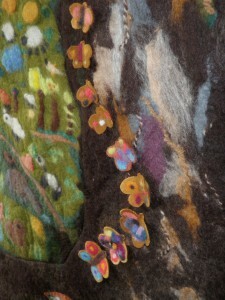 Details were needle felted onto butterflies. 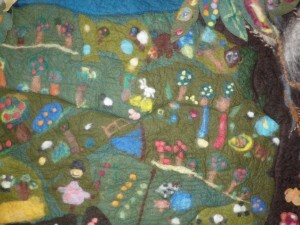 The softness of the fibres was very soothing for the children. The needle felting required focussed attention and concentration. The wet felting technique with soap and water was clean and very energetic as the children watched the transformation of the fibres. 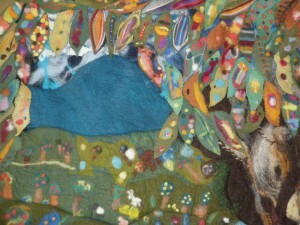 The children created a landscape with orchards, vegetables fields, farm animals, scarecrows and all was under the watchful gaze of Mount Sugarloaf.